Ozone therapy is a veritable Swiss army knife for dentistry, according to general practitioner Eric Zaremski, DDS. It kills bacteria, controls caries and periodontal disease, helps remineralize teeth, and heals tissue after oral surgery. Dr. Zaremski and his staff have incorporated ozone into just about every procedure — from prophies to root canals — for the last decade in his practice in Greenbrae, CA. Many cities in the U.S. and around the world use ozone to sterilize public water systems, and ozone is commonly used to sterilize fruits, vegetables, and bottled water and soft drinks. More than 4,000 U.S. dentists have been trained to integrate ozone therapy into their practices, Phil Mollica, DMD, told DrBicuspid.com. Dr. Mollica is president of the American Academy of Ozonotherapy (AAO) and has a practice in Saddle Brook, NJ. The AAO started developing the integration of ozone into dental practices in 1998 and has been training dentists worldwide since 2002. Ozone, a naturally occurring gas, is the crisp smell in the air produced by lightning storms. When air is passed through an ozone generator, it breaks apart the oxygen molecules to produce ozone’s nascent form, ozone gas. Ozone levels in the atmosphere, which are easy to measure, are used to measure smog, as pollutants such as carbon monoxide and nitric oxide are hard to measure, Dr. Zaremski explained. When used in medical or dental applications, gas ozone molecules break apart bacterial or fungal cell walls, killing the pathogens. Ozone has three categories of application: as a gas, in water, or in vegetable oil. Ozone is great because it’s such a multifaceted tool in the office, both as a preventive and in treatment, according to Dr. Zaremski. Dr. Zaremski has ozone generators in all three of his operatories. “We try to use it with every patient every day in all the procedures we do,” he said. Ozone gas is pumped through the office’s water lines and saliva ejectors to reduce the amount of bacteria. He noted that the benefit extends beyond the staff. “It makes the office a lot safer and hygienic for patients as well as staff,” Dr. Zaremski said. Ozone’s dual ability to disinfect and heal is particularly beneficial in controlling caries, which are caused by bacteria. “We don’t know if we’re actually getting out all the bacteria by drilling out the cavity,” Dr. Zaremski said. Applying ozone gas into cavities diffuses it into the tooth’s pores, killing much more bacteria than drilling and filling. “We’re not getting as many cavities two or three years down the road after we’ve done a filling,” he noted. Ozone also desensitizes teeth, Dr. Zaremski said. For extractions, he pumps ozone gas into the socket, then rinses the socket with ozonated water before adding an ozone oil-soaked gel foam to stimulate healing. Ozone therapy is also beneficial for treating periodontal disease, Dr. Zaremski said, and he estimates that he treats about 400 to 500 patients a year for some form of periodontal issue. “We see pretty close to full resolution and healing by adding ozone to the treatments in almost all cases,” he said. One patient had a 15-mm pocket in an implant in the upper arch, which was reduced to 4 mm following ozone treatments, Dr. Zaremski said. The healing time depends on the severity of the problem, usually within three months. 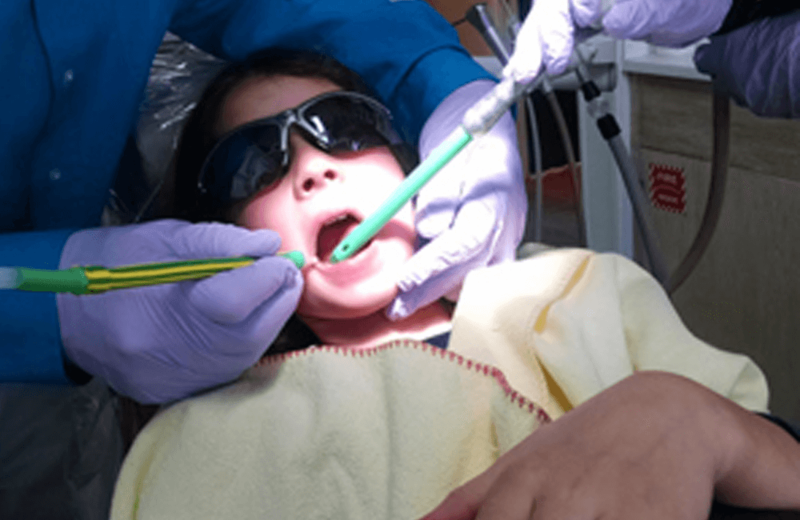 After being certified as an ozone trainer, Dr. Zaremski has taught several other dentists to use it, including Martin Jablow, DMD, a Woodbridge, NJ, dentist who writes about dental technology. Dr. Jablow explained that he uses ozone in many dental procedures such as caries therapy, remineralization, endodontics, and periodontal therapy. A two-day course from certified trainers like Drs. Mollica and Zaremski costs about $2,500 and covers the nuances of ozone therapy, to ensure it is not used indiscriminately or in an incorrect fashion, Dr. Zaremski said. Equipment ranges between $1,000 to $5,000 per operatory. Certified training qualifies as continuing education credit, according to the Academy of General Dentistry (AGD). The U.S. Food and Drug Administration (FDA) gave ozone therapy a “Generally Recognized as Safe” approval in 2001, according to ozone system supplier Ozone Solutions, for use as a disinfectant for water and food, as well as a preservative. Dr. Zaremski also noted this approval. In 2002, the FDA issued a regulation exempting dentists from oversight with medical devices. And because generators are used to apply ozone gas, medical practitioners can use it in a medical fashion. Dr. Zaremski noted that only 10% of the agents used in dentistry have FDA approval, like the common use of bleach to disinfect root canals. Ozone therapy would be particularly beneficial on underserved populations as a preventive and in treatment, Dr. Zaremski pointed out. “It’s a perfect tool for community clinics, because everybody can use it. It’s simple and effective,” he said. People need to be certified and trained to use ozone therapy, but they don’t need oversight by dentists, because it’s not invasive, so hygienists and assistants can use it. “Everybody in the office can use it to treat patients, which is huge,” Dr. Zaremski said. He also uses ozone therapy during his annual trips to Belize, where he provides oral care to local women and children. Dr. Zaremski is now doing research to analyze the efficacy of ozone on schoolchildren with caries. He will present research at the AAO annual meeting in 2017 and at the International Scientific Committee of Ozone Therapy. He also plans to do research using ozone-encapsulated oils in Belize and at his office. For this, he’ll give ozone capsules to patients to see if their blood enzyme levels change after 30 days. For Dr. Zaremski, ozone therapy is a way to incorporate minimally invasive techniques. “I want to do more than just drill holes in people’s heads,” he said. This entry was posted in Ozone Therapy and tagged fights caries, helps healing, kills bacteria, Ozone Therapy.